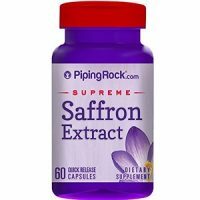 Piping Rock Ultimate Saffron Extract Review - Does It Work? Today we review Piping Rock Ultimate Saffron Extract. This easy to take supplement has pure extract from the Crocus Sativus plant, which is the flower where saffron is found. This particular quick release formula claims to help with weight loss and weight support. What’s in Piping Rock Ultimate Saffron Extract? Each capsule contains 88.5 milligrams of saffron extract. The capsules are made of Vegetable Cellulose, Silica, Vegetable Stearate, making them vegetarian-friendly. The one thing that worries us is that, through our research, we learned that at the current moment, the standard daily dose of saffron extract is only 30 mg and increasing that dose could have potential harmful effects on the body. Just one capsule of this supplement has almost triple the daily recommended amount. How Do You Use Piping Rock Ultimate Saffron Extract? The manufacturer suggests taking two capsules daily, once in the morning, and again in the evening. 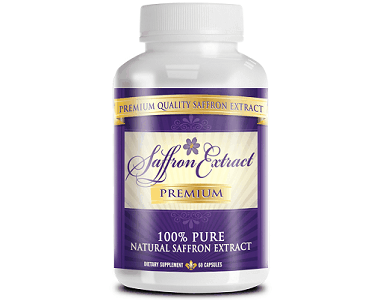 As stated above, the current research states that someone should only take a maximum of 30 mg of saffron extract per day, for a total of eight weeks at a time. By following the recommendations of the manufacturer, you would be ingesting 177 mg of saffron extract per day, which is a whopping 5.9 times the recommended amount. From our research, we also learned that just 60 mg of saffron extract per day could cause harm, so this amount of saffron is quite problematic to us. This supplement is originally priced at $10.69, but is currently on sale for only $7.99. While the low price is attractive, saffron is one of the most expensive herbs available, which makes this low price concerning. In order to have as much saffron inside each capsule as the manufacturer claims, we would expect to see a much higher price to reflect the price of the actual saffron. While there is no guarantee listed on the manufacturer’s website, there is a return policy available. For customers within the US, if unsatisfied, customers have one year to choose to return their product. The return can be of any unused amount of the supplement, and once the manufacturer receives the return, either a credit or refund will be issued. For international customers, you have 60 days from the date of order to choose to make a return. Only unopened products will be accepted for a return. Also, instead of a full refund, you will be issued the price of purchase minus any shipping costs, any discounts, and a 20% restocking fee. In addition to all of the fees for an international return, if the manufacturer decided the fees will be greater than the original price of the product, they can choose not to accept the return, and you will not be issued a refund at all. There are a few things we liked about Piping Rock Ultimate Saffron Extract. First off, the vegetarian capsules make them easy for anyone to take this supplement. We also liked that the only main ingredient is saffron extract. Unfortunately, there were many things we did not like about this product. To start, the dose is extremely high compared to what studies have shown. We are concerned that such a high dose could have a harmful effect on the customers. Secondly, while the low price could seem attractive, it worries us that such a high priced herb is being sold as a supplement at such a low price. Lastly, there is no true money back guarantee. If you are unsatisfied with the product, you may not be able to get a refund for the unused portion of your supplement. Instead, the manufacturer may just give you a credit for another supplement that may or may not work. 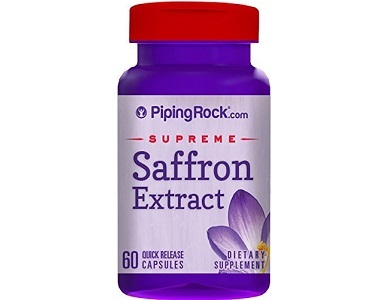 Overall, we cannot recommend Piping Rock Ultimate Saffron Extract.